The year 2008 was when I first noticed chefs performing chef-y things to a burger. It seemed like forever ago, but it was only 10 years back—a blip in our celestial existence—when the idea that a hamburger could be high art was still a novelty. Outside a handful of steakhouses that could repurpose trimmings and scraps into patties, the highest levels a hamburger could expect to reach at the turn of the millennium were the mid-price, family restaurant-types. You were either a multi-generational hamburger specialist, a diner, or a Red Robin/Fuddruckers. A burger was proletariat food. Two recently released cookbooks come from high-profile burger restaurants whose chefs who plied their trade in fine-dining. Superiority Burger Cookbook (W.W. Norton) is the brainchild of Brooks Headley, the punk drummer/James Beard Award-winning pastry chef/owner of beloved vegetarian burger restaurant Superiority Burger in Manhattan’s East Village. Three thousand miles away to the west is was KronnerBurger, the Oakland, California burger shop from Bar Tartine-alumnus Chris Kronner. The restaurant closed in February after a fire and now lives on as an occasional pop-up, and in the cookbook A Burger To Believe In (Ten Speed Press). 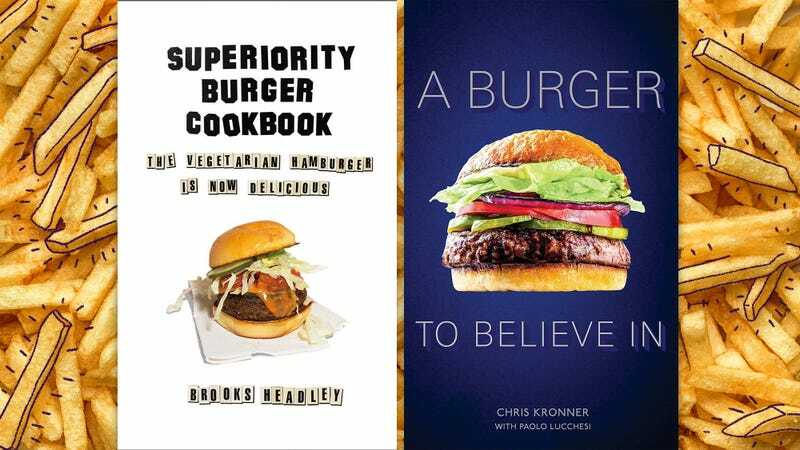 The two books lie on opposite ends of the burger spectrum—one’s a pithy and goofy chronicle of a restaurant proudly flying its veggie burger freak flag, the other a loving and exhaustive treatise on how to engineer the optimum beef burger. The idea that in 2018, two high-concept burger cookbooks would be released within weeks of each other, the 2008 me would have to make several rational leaps: 1) That it’s possible the hamburger could be a blank canvas for fine-dining chefs, and 2) American diners would accept the hamburger as a legitimate, sit-down restaurant entree worthy of $10-plus price tags. We’ve truly come a long way. 1. Ground beef is 70 percent water. Kronner suggests avoiding meat that’s been frozen or previously frozen because freezing causes cellular ruptures—in other words, “your meat deflates and shrivels up.” Even though it may be an added step, Kronner writes that “freshly ground beef may change the way you think about hamburgers.” Get to know your friendly neighborhood butcher, and make sure the butcher doesn’t trim and throwaway the excess fat. 2. Steam-toast your buns for best results. Kronner’s preferred method is to slather room-temperature butter onto buns before toasting it on a skillet. Kronner says griddling buns butter-side down has several benefits: It toasts the exterior crisp, while “the moisture in the milk solids turn to steam, which rises and helps soften the buns.” (If you don’t want to make the bun recipe from the book, Kronner says American-style white burger buns are just fine. If you opt for brioche buns, many are often too thick. Kronner suggests slicing out 1/2 to one inch from the middle for oversized buns). 3. A ring mold will bring up your burger patty game. This seems rather obvious, but then you realize most of the time you just slap the ground beef between your hands until it resembles a thickish hockey puck. A ring mold—Kronner uses a mold four-inches wide and an inch deep—keeps the burger aesthetically presentable (I hate the shriveled patties with the hump in the middle), and keeps cooking times even if you’re grilling many patties at once. Kronner suggests laying the ring mold on a hard counter, laying in a sheet of plastic wrap, adding five ounces of ground beef into the mold and pressing down with your palm to evenly distribute the meat. Lifting the plastic wrap will easily dislodge the patty from the mold. 4. Split the difference with your onions. When it comes to onions as a burger topping, there are those in the raw camp and those in the grilled camp. Kronner says he likes to straddle both worlds: He’ll take 1/3 inch-thick red onions and char only one side until it’s dark and caramelized, while the other side retains that raw onion bite. To do this in a cast iron skillet, wait until the pan is smoking hot, then place the onion ring in the pan for about three minutes without moving it. 5. Embrace the hand-cut steak burger. One of Kronner’s chef colleagues devised a method of turning a 24 oz. ribeye steak into a burger dinner for four. You do this by chilling the steak in a freezer for about 20 minutes—you don’t want it to be freeze over completely, but firm enough to dice with a sharp knife. You then slice the raw beef into 1/4 inch-thick pieces, then into cubes, and use this to form into patties inside the ring mold. The patties will be very loose to handle, but when you sear in a skillet on high heat for a minute on each side, the end result is a true steak burger worthy of royalty. 1. The Superiority Burger wants to rehabilitate the maligned veggie burger. The Impossible Burgers and Beyond Meats of the world attempt to replicate the taste and texture of a beef patty. Those faux-patties are, in effect, cover bands. What the Superiority Burger does, in Headley’s words, is “be the Luddite response to the modern gaggle of vegetable patties that bleed and squirt and ape.” His burgers are constructed from a melange of chickpeas, quinoa, carrots, walnuts, onions, then seared until it resembles a crispy croquette. The Washington Post’s food editor Joe Yonan made the recipe from the cookbook and reported positive things, including “brilliant flavor-building strokes” such as an extended roasting of the diced carrots and vinegar to deglaze “crispy bits” from the sauté pan. 2. How to make vegan special sauce. It’s simple. The ingredients are a cup of chickpea mayo (Just Mayo would work just fine, and it’s available at most supermarkets), 1/2 cup of roasted tomatoes, 1/4 cup ketchup, 1/4 cup hot sauce, 1 tablespoon red wine vinegar. Blend in a food processor. Season with salt and pepper to taste. 4. Yuba is cool. I grew up with a Chinese grandmother who is vegetarian, and she was fond of serving yuba—crinkly, wet sheets of soy milk skin. Over the last few years, I’ve seen American chefs embrace yuba as a chameleon protein. I’ve tasted it stir-fried, smoked, and at Superiority Burger, shaved and seared and transformed into a vegetarian Philly “cheesesteak.” The yuba recipe used at Superiority is rather involved, marinated with everything from ground coffee and liquid amino to a blended sauce that includes roasted mushrooms and toasted walnuts. 5. An ingenious dessert crumble topping. This one’s also not burger-related, but I’m trying it this weekend. In the Superiority Burger Cookbook is a recipe for a peach-blueberry crumble. The secret ingredient: Sesame breadsticks, the kind found in an Italian delicatessen. In the recipe, you pulse it through a food processor until you get two cups’ worth, mix it with brown sugar, salt, and olive oil. You make the fruit filling and shellack the top with this sesame breadstick paste. Bake until crisp and bubbly. Oh man.